We are currently building a SNC DreamChaser cockpit, with a semi circular screen. The shell mock-up is already delivered, and we are expecting the screen next week. Question is what should be considered while choosing the projectors (caracteristics? ratio? ) and what are good example of model/mark ? Thank you very much for your hints, comments, remarks and links ! As someone who installs visuals, I love those small windows in the Dream Chaser! Another option is the Immersive Designer Pro software from Fly Elise. I use it for both personal use and in my professional cockpit building. This software has a master list of projectors so you can build the visual graphically, then determine the throw ration and other important factors in picking a projection system. I have used it in building a B1900 and a CRJ-700 cockpit with either 3 or 4 projectors. If you can read french, i can send you documents i wrote about my configuration. On the choice of projectors, be careful, there are a lot of great choices out there, just make sure you pick a well known brand, Don't go for the Chinese no name brand stuff and you'll be ok.
We will like to see pictures of your project! Welcome to the confusing world of projection displays for your Sim project. As they say... "It's easy when you know how." Going through the learning curve however, can take quite a bit of time, and it can be expensive - depending on the projection setup you choose. I was using three 70" LCD monitors in an Nvidia Surround mode. This worked great as the detail and contrast was excellent, and there were no problems with daylight viewing. However, when I saw Sam's and Fred's wrap-around projection displays on their 737 Sim setup, I realized that I was missing quite a bit of additional "Sim Immersion" with my flat LCD displays. I decided to change over to a projection setup for my own 737-800 Sim project. 1. Space available for a projection screen; size of the screen, desired projected image, Radius of screen, and type of screen material. 2. Manufacture and Model of the Short-Throw projector, and its throw-ratio. 3. Warping and Blending software. 4. Graphics card used for the Sim. Regarding the space available for a multi-projection display... As with most of our Sim setups, there are physical layout consideration to be concerned about, in addition to any "blockage" of the projection image by the Cockpit Nose Section. These considerations will establish practical aspects related to screen size and projector throw-ratio in order to achieve the desired projected image. Resolution of the projected image is another consideration, which is more a function of the projector specs. True HD or WXGA are good choices. For my Sim display setup, I chose to use three of the Optoma GT1080HD projectors, with a throw-ratio of 0.50. These projectors offer excellent value/performance for the money. Another consideration is the number of degrees of wrap-around you desire. This can be somewhat tricky to determine, as there are practical limitations as to what is realistic. For example... 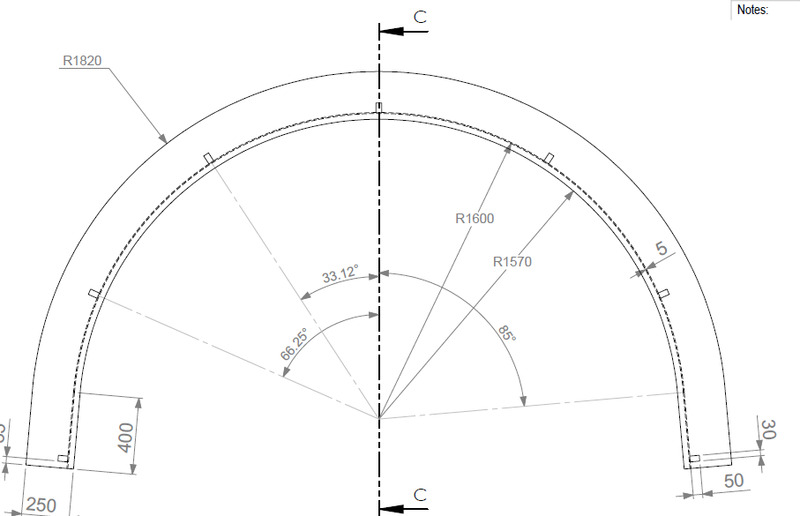 If you want a 220 degree wrap-around screen that is 12' in diameter, then that will dictate projector mounting consideration and the throw-ratio of the projectors. One of the major factors in this has to do with the "blending" of the projected images. There needs to be at least 12% of projected image overlap, in order to achieve a reasonable blending effect with the warping/blending software, which in practice is very difficult to achieve, without having the typical vertical sections on the display where the projection images merge with one another. In the example above, there are projector mounting considerations in order to achieve the "projected image spread" across the screen. Most guys choose to mount the projectors adjacent to one another at a distance that will yield the largest projected image from each projector - each projector (eg. a three projector setup) having a angled separation to achieve the projected image placement on the screen. In practice... It is very important to ensure that each projector is accurately positioned and well secured in its mounting location. This is because the warping/blending software depends upon the projector physical location and mounting being hard-mounted and secure - otherwise, you will get image shift on your display. The consideration of the type of screen material is very important. Screen gain, reflection qualities and other such projection screen details aside... The most important consideration (IMO) is the stability and smoothness of the screen surface. If the screen material has any defects, ripples, warps, etc, - you will see them in the projected image display result. Having any kind of waves across the screen will show up as glaring display defects when the scenery is moving during a flight - regardless of how well you aligned the projectors, etc. The type of screen material and surface treatment for a do-it-yourself screen varies with each builder. After doing a number of testing with various screen materials, I settled on 0.030" thick Matte Formica material. You can purchase this material in 4' x 12' or 5' x 12' sheets. In my case, I joined two 5'x12' sheets, fiber glassed the back pieces, Bondo'd the central seam, sanded it smooth, then painted it with Latex Kiltz Stain Blocker paint. Kiltz sticks to anything, and can be applied with a fine-nap roller. The result was a 5' x 24' screen that when curved on a 12' diameter form, gave a very even and smooth surface when it is arc'd and clamped to the curved form. Also, in testing various screen paints, I found that I liked the Kiltz the best. For me... This compared very nicely to some professional quality screen materials that I tested. I use a "warm" color temp on the Optoma GT1080 for a very pleasing display result. Going back to planning your projection setup... I found the very best tool for this was to use a Projection Calculator. I use PixelWix Projection Calculator. This is exactly the same as what you can buy from Fly Elise. This is well worth the money, as it totally takes the guess work out of the equation. You are asking for trouble by trying to guess at how a projection setup needs to be configured without this tool. My original goal was to achieve a 220 degree wrap-around projection display. However, with the budget I had in mind, and the Optoma projectors I chose, and the space I had available, and the resolution I wanted, with the FDS Nose Section interference considerations, etc..... I finally made the best compromise for my Sim setup, and settled on a 180 degree, 6' radius screen that is about 18' linear length. I may in the near future try to achieve larger wrap-around, but for now, that seems to be a reasonable approach for my particular Sim setup. As a side note... My projection display setup must also mount with the Sim on top of a 6dof Motion Platform, so you can imagine the added complications. As pointed out on this thread... There are lots of warping and blending software solutions. I would suggest going with PixelWix (OEM developer) or FlyElise's offering in Immersive Pro - same product. There is a learning curve with this software, and it takes a degree of patience to get the alignments correct, and even more patience getting the blending correct or pleasing to one's eye. I would say that it is nearly impossible to achieve a "perfect blending" of the projected images on a beer budget. That said... You can get very close and achieve a very pleasing display result. Also, it may be worth mentioning that it takes a lot of computing power to handle a multi-window display. In my Sim setup, I chose to cheat the system by using a single high-end over-clocked computer for running FSX with a single Nvidai GTX980 OC graphics card. I used the Kosta tweaks to FSX with the GTX980 in a Surround mode for a 5780 x 1080 display. With this configuration, I am able to achieve a fixed 30 fps running with reasonable Slider settings, using photo scenery and detailed airports - I mostly use Orbx and enhanced terrain mesh. These kind of system considerations are typical of the complexities, and highly subjective and quite varied, but the computer systems for your Sim will definitely play an important role in how well your projection setup will function and perform - especially in a multi-windowed projection configuration. Anyway... This is just scratching the surface on projection display considerations. It is not easy, and can be very frustrating if you don't take your time. The good news is that it is not rocket science, and it has been done before, so anyone interested in setting up a multi-projection system can enjoy success. Nice Reply Mike... Great Contribution. on the projection option and screen blending. With a 3-projector setup the effect is minimized since we spend 95% of our time eyeballing the center of the screen and really only looking out the sides while lining up for approach and figuring out where the taxiways are. This is something I can live with, since the complexity of overlapping displays, coupled with blending and masking is something I just don't want to deal with. I can live with a few degrees of mismatch at a very small scale, as opposed to a rather largish percentage of overlap that may very well not be matched correctly unless you want to spend $$$$ to have someone on-site to perform the screen alignment. After WF2015 I plan on redesigning my screen layout so that it's not a perfect 6-foot radius but rather a flat-ish forward view with a slightly progressive curve towards the edges. It will fit in the sim room better and more of the screen will be in sharper focus. Without blending, you may expect colour differences at the 'seams' since even "identical" beamers show these differences. I am very satisfied with the Warpalizer solution. Page created in 5.628 seconds with 27 queries.